We don't know all that much about Dietrich Buxtehude's life and a lot of his music has disappeared, but what survives is certainly well worth paying attention to. 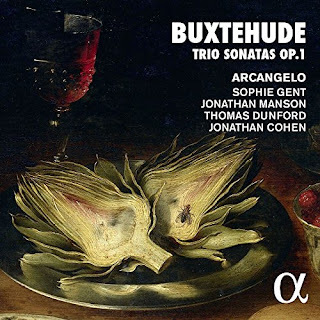 On this disc, from Alpha Classics, Arcangelo (Sophie Gent, violin, Jonathan Manson, viola da gamba, Thomas Dunford, lute, Jonathan Cohen, harpsichord & direction) perform Buxtehude's seven trio sonatas Opus 1 (BUXWV 252-258). The Hanseatic league territories (the Baltic and Northern Germany) loom large in Buxtehude's life, his father was an organist who spent a lot of time in Denmark (and territory then ruled by the Danes) where Dietrich received the early stages of his musical career. His major musical appointment (which took place in 1668 when he was around 31) was to the Marienkirche in Lubeck, the leading Hanseatic city, and Buxtehude would stay in post for the rest of his life, developing a huge reputation for his organ playing, his innovations of evening concerts (Abendmusiken) during Advent, and for his compositions. The works on this disc are Buxtehude's Opus 1 (printed in 1694). Whilst they were published in Lubeck, Peter Wollny's article in the booklet highlights a number of links to another important Hanseatic city, Hamburg. This, perhaps, helps explain the trio sonatas unusual line up; a conventional trio sonata would have two melody instruments and a bass (usually harpsichord and cello doubling), but for these sonatas Buxtehude uses a violin and a viola da gamba, thus having two instruments which are markedly different in pitch and timbre, and there are a number of predecessors produced by Hamburg composers. The importance of the Hanseatic cities is that the culture developed was very much pan-national, spreading round the Baltic by sea and it was the sea-rout trade links with other European countries which helped developed a musical culture which linked to England, the Netherlands and beyond. What is striking about these sonatas is that not only are they full of rigorous counterpoint, as you would expect from a German composer, but they are completely engaging and full of imaginative touches. Buxtehude clearly revels in the opportunities which his forces give him, and there are many passages of great delight. Perhaps a key to the works is that each sonata is in one single movement (on this disc they vary in length between 7 minutes and nearly 10 minutes long). Within this, Buxtehude employs great compositional sophistication, there are clear links to the composer's organ preludes, but he also obviously enjoys mixing formal structures with freer, more improvisatory passages. The performers clearly take as much delight in the music as Buxtehude did, and their enjoyment really shows. These are technically superb and highly engaging performances, with the players giving us a strong sense of the chamber-music nature. The sheer fluidity of the music is reflected in the performances as the give and take between players reflects the way the music flows. Buxtehude published two sets of sonatas in this format, and having given us the first set in such entrancing performances, I certainly hope that Arcangelo will be giving us the second.